Joe and I drove southeast this morning to visit Alderbrook Farm in Dartmouth, MA. We were a little lost for a while (Joe loves calling friends while we're driving and as the Navigator, he pretty much dropped the ball). But we found the farm. 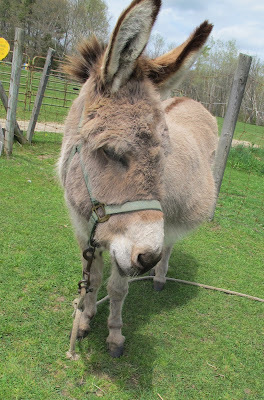 I made a bee line for the donkeys. Joe bought coffee. All the donkeys were on long tethers at different parts of the pasture, along with GIANT cows/bulls..they had horns, but were pretty docile. Here is my first introduction. 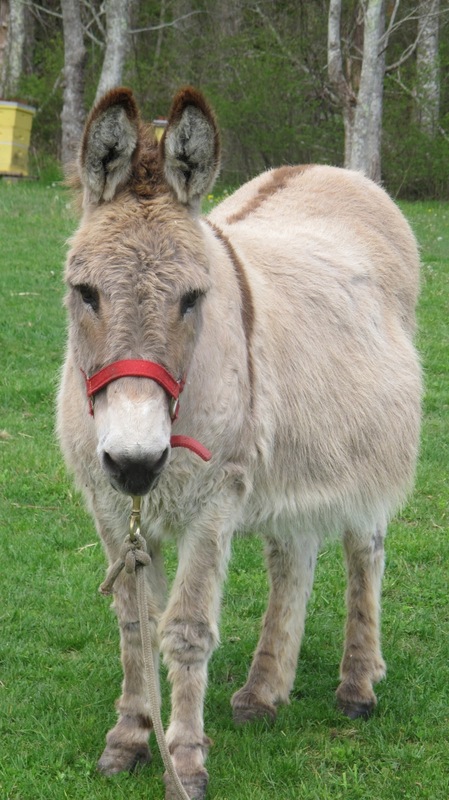 Pretty little mini donkey. She was very quiet, very still and seemed to like her ears stroked, but didn't offer her muzzle to me. This is her 'husband'. They've had a few babies together, but the female is done now. He was pretty engaging. He gave one good Hee Haw, then rolled in the grass. He also walked toward me, pushing his head against me. That was fun. And then, there was Jack. Jack ran away from me when I approached him. Joe had slowly followed me out to the pasture, stopping to visit with the horse. (he's more interested in horses). After Jack spurned me, Joe approached him with slow, baby steps until he reached his halter, then invited me over to pet him. As we visited with Jack, Allen, the farm owner drove up in his little golf cart (he's pretty old) and said, "you folks must be special people. Jack doesn't let most strangers close to him". So, Joe is the donkey whisperer. I'm chopped liver. damn. I WAS grateful to have the chance to stroke those ears and look into those beautiful eyes. Doesn't he look pretty in red? Allen said Jack had been abused by his former owner. But Jack loves his Mom (Allen's wife for whom Jack was a present) and apparently thinks Joe is o.k. This is my last donkey blog for a while. Next visit is to Sweet Meadow Farm which provides the rabbit's favorite organic hay and is much closer than Dartmouth. They just finished a new barn for their donkeys who are coming back to the farm in late May. It's Mother's Day or bust this week! So, I don't quite get it. Are these farm open to the public or are you just showing up and chasing the donkeys around on your own? My mother and I got lost in Dartmouth as I recall it. We were going to Avant Gardens. I got the directions off their website, followed them exactly and ended up in Dighton. Four times. It was 96 degrees and I was steaming mad. When I told them what trouble I had, they said the directions were wrong on the website and they would give me a plant to make up for the trouble. Everything looked ugly after that and I didn't buy a thing. Steve - I went to Avant Gardens when I first went to Alan Haskell's. It was drizzly and cold. Noelle - there's time to figure this out. I have a lot to learn about donkeys. Thanks for visiting! Pretty damn cute, those donkeys! Such sweetness in their faces.